Earlier we defined economics as the study of how people choose to use scarce resources to best satisfy their unlimited wants. Economists try to analyze these choices both at the individual level (what wage does Alissa require in order to take that job?) and broader societal level (what is the impact of minimum wage on the unemployment rate?). The principal tools economists use to do this are models. Economists use math as a tool for manipulating and exploring economic models. Sometimes it makes sense to express economic ideas in words; other times, math does a better job. Economics is not math, but rather math is a tool for presenting and manipulating/exploring/using economic models. Many economic models use math to explain cause and effect. Don’t worry, though, we’re going to cover all the math you need to solve the problems in this course. 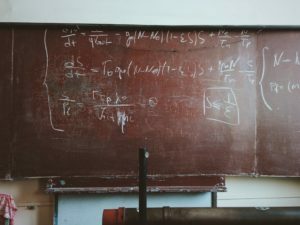 This section provides a quick review of some basic math (so you can avoid common errors) and then introduces the mathematical concepts you’ll need throughout the course. Don’t forget: return to this section later on if you encounter math that you can’t follow. Some students, when they find out that economics involves math, fear that the math will trip them up and prevent their success in the course—“I’m not a math person!” they think. If you share these thoughts, it may surprise you to know there’s scientific research showing that when you practice new ways of thinking, your brain physically changes and adapts. Essentially, there’s no such thing as “a math person” (or an “economics person”). You don’t need a special talent or aptitude. It’s mainly a matter of practice, hard work, and training your brain. The more you challenge your mind to learn, the more your brain cells connect to one another and the stronger those connections become. Do the practice problems in the course. Explain the ideas to yourself in different ways until they are clear. You will need to learn new things to pass this class, and you should expect it to feel hard as you wrestle with unfamiliar ideas and new ways of thinking. Don’t give up, though! The feeling of struggling is a normal part of how the brain gets stronger when it learns things.